Western Sydney on Western Sydney | Me fail? I fly! This entry was posted in Books and tagged Amanda Yeo, Andy Ko, anthology, Bill Reda, BYDS, Felicity Castagna, Fiona Wright, Lachlan Brown, Luke Carman, Michael Mohammed Ahmad, Miran Hosny, Rebecca Landon, Tamar Chnorhokian, Tharunka, The School Magazine, Yanko Tsvetkov. Bookmark the permalink. I love those Tharunka maps, Jonathan – even better than Yanko’s ones. 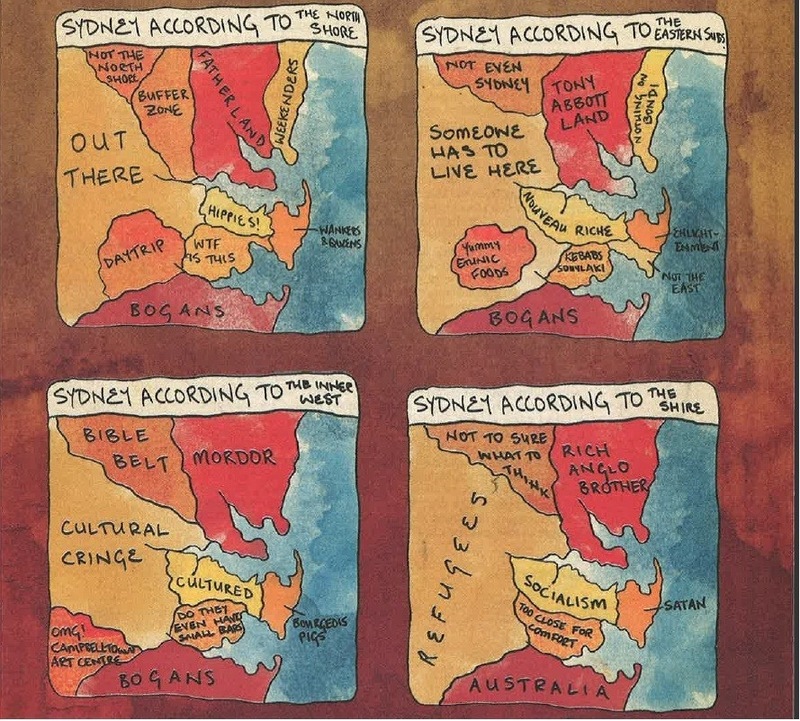 I recall years ago challenging good Eastern Suburbs folk by insisting that I lived in the Eastern Suburbs too (though as with the map shown) I was living in Botany. At other stages of my life it was Paddington – and Forest Lodge and Croydon Park and Marrickville. Born at the RNSH and living first in Thornleigh (now Westleigh) I have house-sat in Lalor Park and Hunters Hill and Beecroft. At present my wife and I are renting a place (some weeks only) on Dekalb Ave – Fort Greene – in Brooklyn – and the resonances of the Tharunka maps are just the same here – in the various parts of Manhattan (just across Brooklyn Bridge) or to the North – as well as across the Hudson in New Jersey – or across Long Island Sound to Connecticut. Over the past couple of weeks on Martha’s Vineyard (West Tisbury/Vineyard Haven/Oak Bluffs/Edgartown/Aquinnah) it’s the same story – nuances to place. Big money Edgartown. And Vieyard Haven too – yet in Oak Bluffs the internet security NORTON family has a summer retreat – and another little place – one of the gingerbread houses is a holiday place of Michelle OBAMA’s college room-mate. Art BUCHWALD lived in Vineyard Haven – and elsewhere is Geraldine BROOKS – and Mike SECCOMBE. And the Wampanoag descendants at Aquinnah. But where I formerly lived in Western Japan – it was essentially meaningless to ask where someone lived as a means of pigeon-holing them. Fisher-folk lived cheek-by-jowl with some of the oldest and wealthiest families. By the sea – sea views – was also without social cachet – usually implying enormous concrete tetrahedrons arranged to protect against heavy seas – or with implied dangers (unless high up) of typhoon whipped up seas – even – Heaven-forbid – the lurking (if rare) dangers of tsunami! I’ve just finished reading New York: is a different country – edited by Heather Reyes oxygen books 2011 – which I found at Kinokuniya just before departing for the US – reading parts aloud on the subway to my wife – everything pertaining to a place/places to which we had just been or were on our way to visit – as they do! And dipping back into Helene HANFF’s Apple of My Eye 1977 (she earlier wrote: 84, Charing Cross Road) which she was commissioned to write after the success of the earlier work! And to-day I picked up the recently 2012 published biography of Howard ZINN by Martin DUBERMAN Howard Zinn: A Life on the Left (ZINN – deceased -the author of A People’s History of the United States – beyond which one cannot go in uncovering the truth of that land)! I know I’ve strayed, Jonathan – from your review of Westside’s literary presence – but I do appreciate your eye for our literature which broadens our sense of who we are! And thank you! And those writers! Pingback: The Other Way | Me fail? I fly!